A rainstorm Friday night put a serious damper on my plans to leave the ranch Saturday, and I found myself looking for something fun to do in the mud. I glanced into the garden and my decision was made - what a perfect time to dig up the yucca that was threatening to take over. How hard could it be? The "leaves" on the yucca plant are actually cleverly disguised skewers, and every attempt to get the shovel near the base of the plant drew blood from my shins. I didn't have a suit of armor handy, so I decided to cut off all the leaves before continuing to bleed dig. How hard could it be? ...despite the jeering and heckling from the peanut gallery. As near as I could tell, the roots of this yucca extended somewhere into the next county, so I sawed off what I could and filled in the hole. Baby yuccas will surely sprout from this patch of ground in the future, but I'll yank those out as I see them. How hard could it be? when they're big enough to wander outside their coop. I can surely relate Carson ... I had two 'clumps' of what is called a 'decorative grass' that I wanted GONE, and whatta job that turned into! Yes, razor sharp 'leaves' and roots to China!! Determined this chore wouldn't beat me down, the mission was finally accomplished and so far no 'baby grasses' have appeared. It is a good feeling when you've finished such a job though, isn't it? UGH! 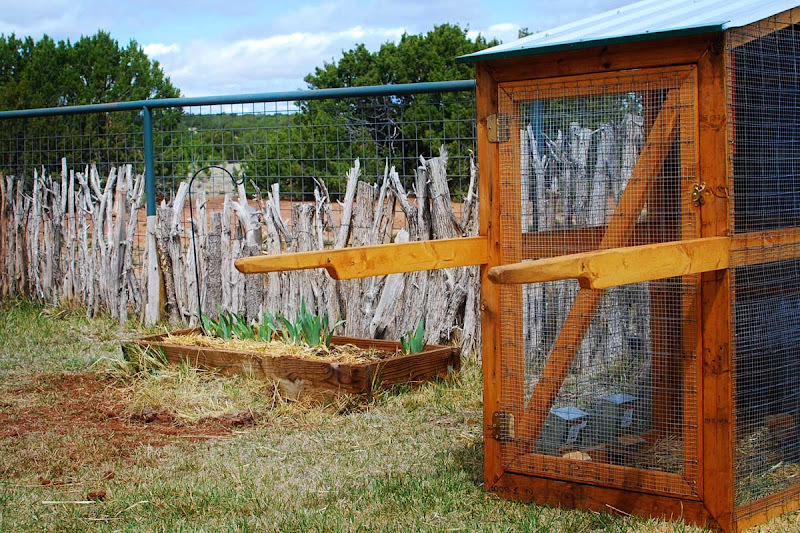 I really like the design of your chicken tractor, did you use any formal plans for it or design it yourself, I would like to do something simular. The yucca is a pain!! Looks like a productive day, what is coming up in the raised bed? Aren't they the worst? Not only are they dangerous, but I think they're ugly to boot! My son actually bought one to plant in front of his new house. I told him, "you'll be sorry". Oh Boy, I guess that is one plant I am glad I don't have to contend with! That brings back memories of my gardening days in Albuquerque. The old ladies I worked always had similar projects in mind. 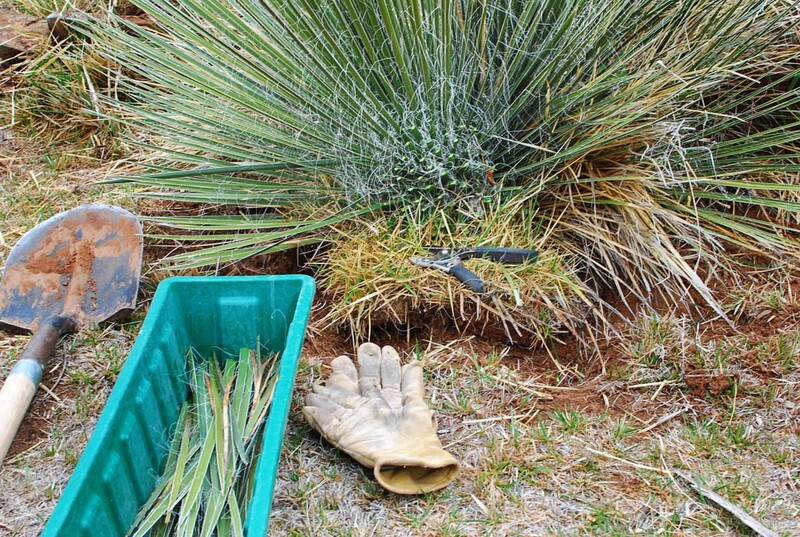 Digging out yucca plants is hard and painful. I wasn't as smart as you and cut off the stems before I dug them out. You made a lot of progress in one hour! Look at the assortment of tools you were able to run and bring to the job in just one hour! Couldn' y'just burn the dang thing? Seriously, you need a swedish assistant! Yucca's are pretty to look at but that is about it. We pull the heads off as soon as they are done blooming so they don't reseed themselves. We pulled many from the pasture at my daughter's and then started burning them. Oh my, the smell and the smoke. The Indians used yucca for soap or something along those lines. 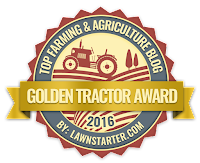 Your credits just keep going up in my book - Master blogger, Master gardner, Master pet lover...... do u also crochet? 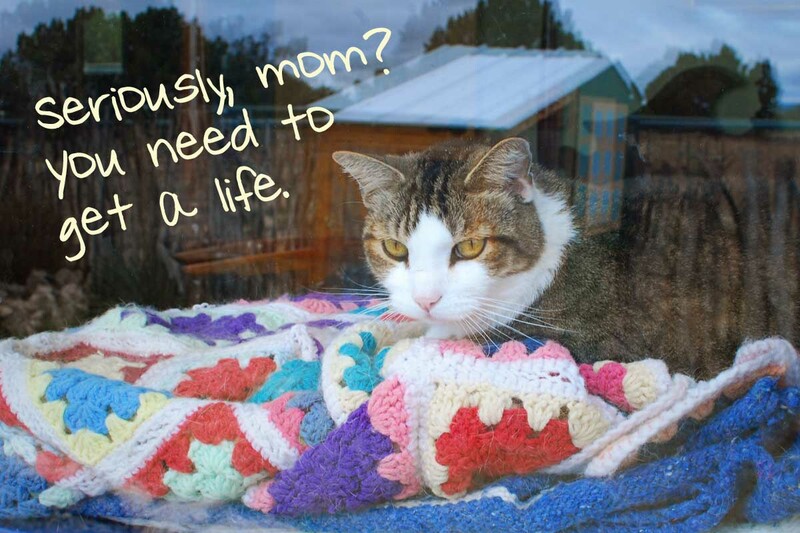 Love the blanket the cat's on... Is that some type of lily coming up in the raised bed? Laura - I bought my chicken tractor off the rack and can't take credit for the design. And those are irises trying to come up in the raised bed. They've never made it to the flower stage...maybe this year. Tenacious little bugger. Well done. I trust you managed to limp into the house unassisted for some tlc from the peanut gallery. Lethal weapon...;o) It sure looks nice by the garden now! I've actually ordered a couple of yucca plants in the past, but they croaked. Sounds like that was a good thing! I can sympathize with you on your tough time with the yucca. Years ago I was helping my Grandfather in Arizona to move yuccas and prickly pear cactus around the yard. 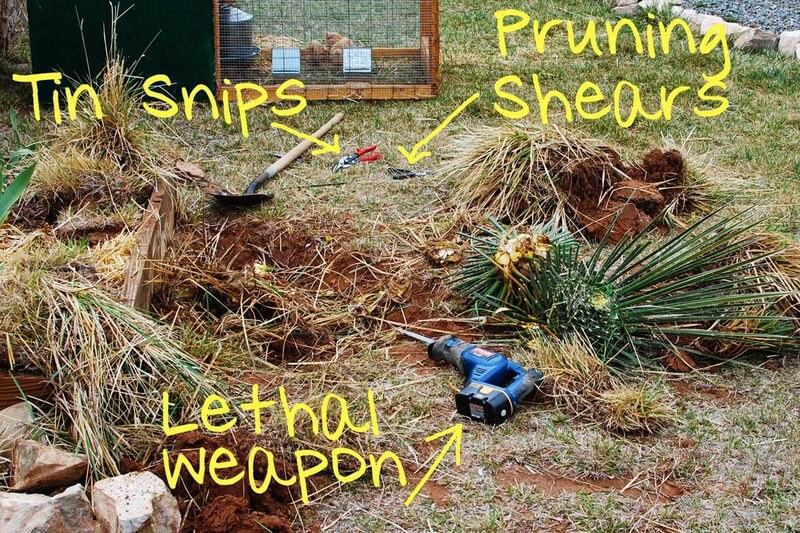 Bloody Yucca and cactus needles may still be littering the yard. Last year I needed to remove a grass I had planted thinking it was a perennial which it was not! So did not see it would be a big deal to get out. Hmm. Ended up having to pull out with tractor! Here in Michigan, one of the few plants you will see green as can be in a snowbank are yucca. I believe it takes 15 years of work to finally get the yuccas removed.....they are like vampires, pretty much immortal. Oh how I dislike Yuccas. We have a different variety here but just as painful no matter which kind it is. Have you ever backed into one? Ahhh yuccas.... I have had many encounters with these which have all wound up with bleeding, amputation of leaves (bayonets!) and colorful language spoken in several tongues. Good job on bagging this one! Quite an accomplishment. I'm from the desert but have no affection for Yucca or Cactus. Too many blood sacrifices. I am not a Yucca fan either. My #1 enemy is bamboo. My husband loves it and planted it and it is taking over. We have a standing joke. If he dies first while everyone is eating funeral food, I will be out back with a backhoe. Yuccas can sure be mean plants to get rid of....This one looked lethel in your pictures...! 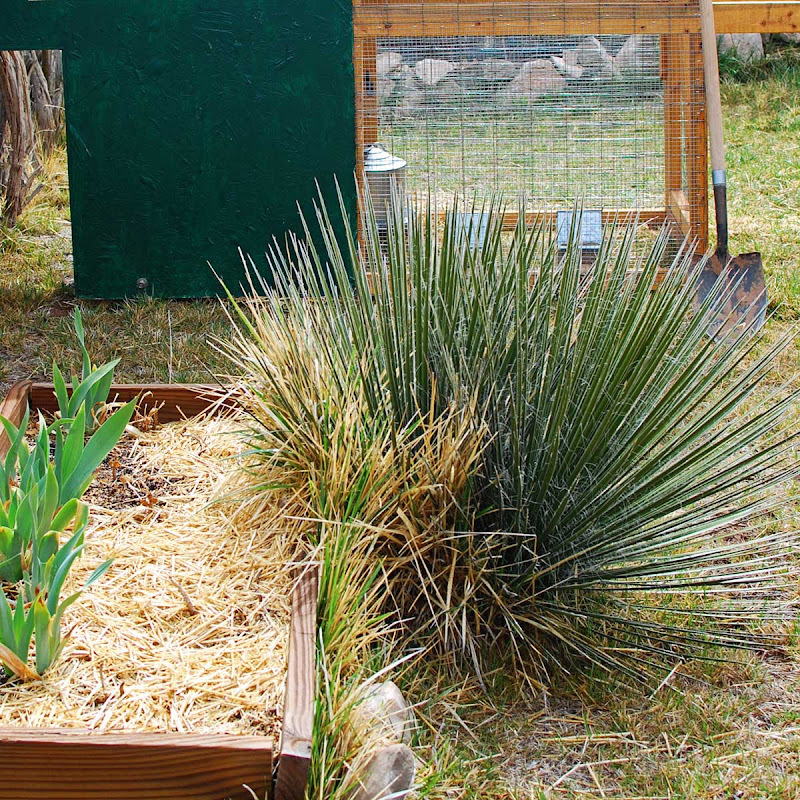 I have quite a few Yucca Rostratas--They Are BEAUTIFUL and grow up very high--They are from Texas. I will have to email you a picture sometime--OR Google them....My Gardener keeps those lower leaves trimmed back so you don;t poke your eye out! Been there, done that....with pampas grass. Finally came down to torching the bugger and the baby buggers that came/come back each spring.